Desert Valley Hospice Society is excited about the many educational and fundraising events we hold throughout the year. Please come and join us for one or all of our events. Your enthusiastic and generous participation is key to making our events a success! For more information, visit our Hike page. Click here and we'll take you there! 10th Annual Celebration of Caring Hands held in the beautiful foyer of the Frank Venables Theatre in Oliver. A Very Special Thank You to Jazz Out West, Maverick Estate Winery and all the wonderful bakers! 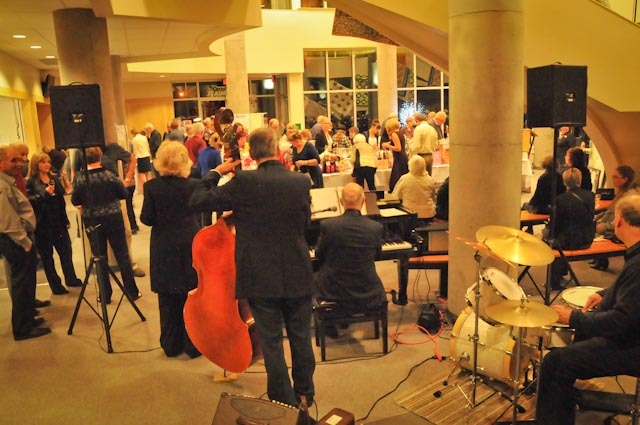 Our 10th Annual Celebration of Caring Hands Wine & Cheese Fundraiser featuring entertainment by Jazz Out West, wines hosted by Maverick Estate Winery, door prizes, silent and live auctions, and our infamous baked goods silent auction was a huge success. Celebration is DVHS’s biggest fundraiser and the proceeds fund a range of programs offered in Oliver, Osoyoos and Okanagan Falls. Thank you to the attendees, sponsors, donors and volunteers for a memorable and enjoyable evening.